A Merry Christmas to all our Friends! At ten, nearly eleven, his eleventh birthday would be in the summer holidays, he felt grown up! He hated his mother. No, naturally he didn’t hate her. Actually he loved her dearly. But WHY in heaven did she have to be so PROTECTIVE? He knew the way to the bus station. It was down at the old bridge crossing the river just upriver from the weir. He also knew the bus station in the small town where he was to attend middle school from now on. Peter was only two years older, but still treated him like a baby, in contrast to his two sisters of eight and six. Those nosy girls Peter treated like ladies. Outrageous! Just outrageous! Olli thought. The bus was already crowded when it came to a stop with screeching brakes. It wasn’t a school bus; it was the regular bus leaving at 6.45 in the morning carrying employees, blue-collar workers, housewives and naturally the middle school students to their destination. Heiner and Kilian, both fifteen and from today ninth graders, pushed into the bus first, followed by Peter dragging Olli along. Most of the seats were already taken. Olli was happy to get a place in the back of the bus besides his brother next to the centre aisle. Being still pretty short, just about four feet two, he could only just see out of the bus windows. He could see the tops of the trees at the side of the road flying by, the forests and vineyards on the steep valley sides and when the bus went through the villages, the little houses, the church towers and beyond that parts of an ancient castle. Nevertheless Olli enjoyed his first ride to his new school while the chit-chat of the older students went in one ear and out of the other. During the first period in his new class he met 32 classmates, 18 boys and 14 girls and his homeroom teacher, a short well-rounded lady with glasses, who older boys called “that bitchy spinster” as he soon learned. Next morning his brother’s classes started later. Olli left home alone, not without being warned by his mother, “Look out, Johnny Head-in Air, the bus….” but he had slammed the door shut way before she had been able to finish her warnings. This morning the bus was even more crowded. Being the smallest at the bus stop he was the last to climb in. He just had snatched the last empty seat besides one of the older students, when their neighbour’s son Heiner, having overslept, jumped into the bus just as it was starting, barged along the crowded aisle and addressed Olli, “Hey BOY, move over, there is enough room for three of us on that double seat, little twerp!” He squeezed on to the seat and not taking further notice of Olli, started to exchange news with the other student, his friend and class mate obviously. “Let’s compare the math homework, Kalli. I guess I …..!” Olli couldn’t follow the discussion about the curve sketching, but now he knew the other student’s name was Kalli. Now for the first time Olli had a closer look at Kalli: brown straight hair, grey-blue eyes, upturned nose and a face full of pimples. Nothing special for a boy hit by puberty Olli guessed. Kalli’s grey-green pullover was faded and his corduroy trousers patched-up. For Olli, as the son of a well-to-do physician, Kalli looked more like a farm hand than a student. Olli eyed him suspiciously, but then he smelled the scent of raspberry fruit drops. Oh, Kalli is sucking raspberry sweets! he thought. This did it. He relished those sweets above all others and someone who liked them had to be trusted! He took the offer and never regretted it. From his seat on Kalli’s lap Olli had an unspoiled view out of the bus windows: of the villages passing by, the trees, the river, farmers working in the fields and vineyards and also of the students, housewives and workers waiting for the bus. It was not just the elevated sitting position and the raspberry scent of the ninth grader’s breath that he enjoyed, but also the feeling of someone holding him tight, someone he could trust and who respected him as a middle school student and called him by his name. During the ride to school Kalli seemed not to take much notice of Olli. He just held him tight with his left arm, using the right one to explain the results of the math homework to Heiner. A week later, also on a Friday morning, the bus was over-crowded as usual. Olli was looking for a seat without success. Spotting Kalli slumped in a seat by the window, reading, Olli screwed up his courage and asked, “Kalli, can I ride on your lap to school again?” This morning Kalli was wearing a lumberjack shirt worn out by hundreds of washing cycles and tattered baggy pants. Snuggling up to his living armchair Olli felt really happy, especially as his chair put away his book to ask and answer questions. During the weeks to come it was routine for Olli to catch a ride in Kalli’s lap at least twice a week. Kalli didn’t mind to act as a living armchair for Olli on the rides to school. Also his class mates Heiner and Killian didn’t mind the friendship between the ninth and fifth grader as their amity was purely restricted on the rides on the bus. In school both kept to their peers. Only Peter, Olli’s brother watched this particular friendship suspiciously. Only one of the students was not excited at all, he even was heavy-hearted. Olli couldn’t just imagine not seeing Kalli five days a week for 6 weeks. However his sadness dwindled when he managed to usurp the seat besides Kalli usually taken by Heiner. Sitting by the window in the hot sun he soon fell asleep resting his head on Kalli’s shoulder who was reading in a book as always. Olli was waiting for Kalli at the big square in front of the former Abbey, where the speech of Professor Bergier the director of the excavations was scheduled. Everyone was already there, Heiner and his mother who had invited to the lecture, Olli´s parents, all his former teachers and school mates, his mates from the middle school and naturally the officials, the mayor and the pastor, just everybody, even the old doddery count with his young wife from the castle two villages down-rivers. All were already present, except of Kalli! Even when nearly the complete audience had gathered in the small lecture hall, Kalli hadn’t still arrived at the Abbey. Olli got worried! Shifting from one foot to the other he remembered what Heiner had told to him, “There is no bus on Sunday morning. Kalli has to take his bicycle!” A terrible thought struck Olli! A car has overrun Kalli! Sure that was the reason! Kalli was never late! This thought made Olli gripes. He decided to skip the lecture and search for Kalli in the roadside ditches. He had to find his injured friend! He simply had to! Just then his big friend turned up, out of breath and soaked with sweat, “I had a flat tire! Damned old bike!” he swore tossing the bike on the ground. “I had to push that old vehicle for the last five kilometres! Now I am late!” Kalli stormed up the stairs into the auditorium without waiting for Olli. Inside Professor Bergier had just started his lecture, “My dear friend Mrs. G., that was Heiner’s mother, honourable Mayor of this unique village, distinguished ladies and gentlemen, dear students!” when Kalli pushed his way to the reserved seat beside his friend Heiner. From his seat in the back of the room Olli did observe the disapproving glaces Professor Bergier shot at Kalli. 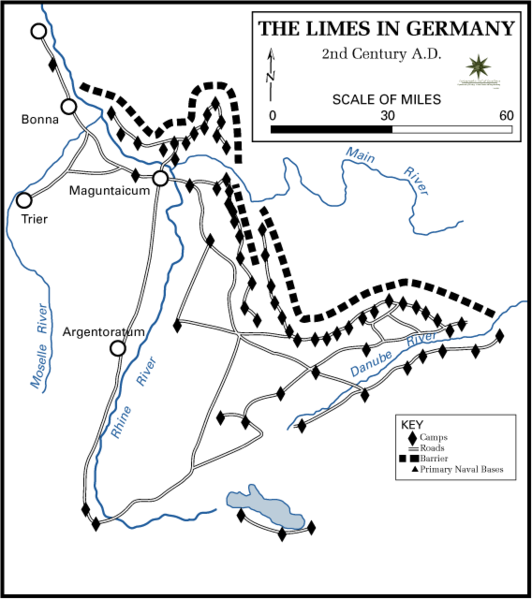 Then the scientist began to describe the relicts of the Roman military camp, its fortifications, its two temples, the foundations of the former buildings and on and on. He even lingered on the fragments of pottery and the coins his students had recovered for example in the remnants of the cesspits of the former public toilets. Olli got bored. He hoped for vivid descriptions of the vicious onslaughts of the German tribes fighting the Roman occupying forces. He wanted to know all about weapons, he wanted to see pictures of broken bones, of severed heads and skeletons of soldiers kill in the fights. But pottery? Olli could care less. He began to look for his big friend. But KALLI!!! Kalli had only eyes for the professor. It seemed Kalli had hypnotized the lecturer or the lecturer had hypnotized Kalli. At the beginning of his lecture Professor Bergier had roamed the audience with his eyes, but now he seemed to give his lecture to Kalli only and Kali was completely absorbed by his words. Olli got restless! He had already waited four long weeks to meet Kalli again and now his big friend didn’t even look at him! Were they still friends? But even worse! When the lecture was finished, the applause had subsided and the last question of the audience was answered, Professor Bergier walked away with Heiner to his right and Kalli to his left. The three set out for the small banquet Heiner’s mother had prepared for her old friend in the manor. Olli didn’t expect to be invited to the dinner and he didn’t mind. However he was outraged by the way the Professor treated HIS KALLI. He didn’t only talk animated with the two ninth graders, no! The six foot five inches tall man was resting his hand on Kalli’s shoulder just the way Kalli was resting his hand on Olli´s shoulder once in a while. Olli got angry, he got jealous, he felt shut out. But just when he turned away to run home with tears in his eyes, “Hey Olli” it Kalli who shouted, “Hey Olli! Come here by me!” and looking up to the tall scientist, he asked, “Professor, you sure don’t mind if Olli comes along with me for the dinner! Olli and I are best friends!” Not waiting for an answer, he put his arm around the fifth grader’s shoulders and dragged the happy smiling Olli along. Summer holidays came and went. Autumn holidays went by also. The weather turned rainy and cold. On some days the grey fog didn’t lift the whole day and soon everybody was depressed. In the first days of December a freezing rain turned the country roads into ice covered slides and people’s frame of mind worsened. Every year the primary school in Olli’s village performed a nativity play. As usual the first performance was scheduled for St. Nicholas Eve. Olli’s sisters had important parts in the play. The plot required a choir which also illustrated the storyline. The last two years Olli had been the lead singer, because he outdid the girls having a far higher vocal range. He loved singing and as a boy soprano he covered the range from A3 to nearly F5. His sisters and his mother had begged Olli to take part this year as well despite attending the middle school. At first he had refused, “I am not a little BOY anymore! I do not do kid’s stuff!” But he liked singing and in the end agreed to take part, but for the last time as he emphasised. On the morning of the St. Nicholas Eve Olli riding in Kalli’s lap to school was rehearsing the songs quietly. “Just for you, Kalli!” he whispered to his friend. ”Because you can’t come to see the play!”. But naturally the other bus passengers enjoyed his performance too and applauded. Between the songs Olli paused and asked, “Do you understand the words of these songs, Kalli? They are ancient hymns!” When Kalli shook his head to give Olli the pleasure of explaining them, the fifth grader explained to his friend, “Of course you can’t understand the words. They are in Latin and we don’t do it in school!” Kalli didn’t know Latin but he knew the meaning of the verses because his Prayer book gave the verses in German and Latin. The first snow flakes were sailing to the ground when the bus arrived at the bus station at the little town where the school was situated. The thick white fluffy flakes were casting their spell on trees, fences, barns, houses and the castle on the hilltop. Even the onion-domed tower of the church now seemed to belong to another world. Just a minute before the students had looked sleep-deprived, tired and depressed, but now they bounced up and down in their seats and after leaving the bus they stormed down the road to the school in high spirits trying to make the first snowballs of the season. St. Nicholas Day was ahead! 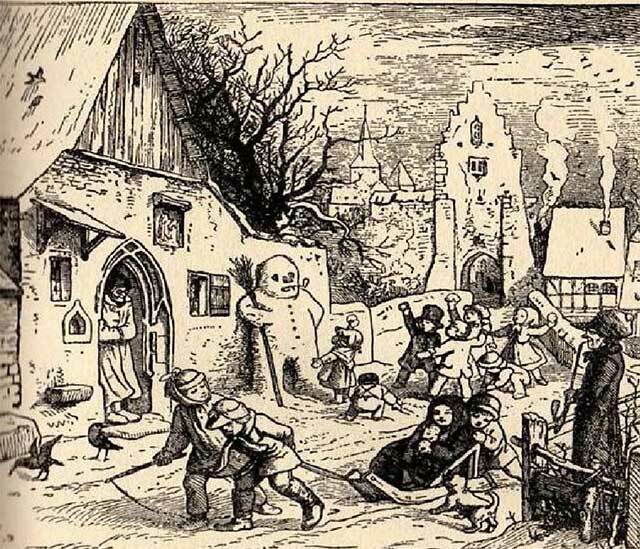 Most were awaiting St. Nicholas with his bag of full of goods while only a few were afraid of Knecht Ruprecht with his whip of birch twigs. During the morning classes the snow piled up and the changed the grey pre-winter landscape into a fairy-tale. The students were eager for snowball fights but the teachers knew why they kept the rascals in the classrooms during breaks. No wonder - fierce snowball fights broke loose as soon the classes were over. After class Olli was looking out for Kalli. The ninth grader was engaged in a fierce snowball fight with his class mates. Olli squeezed a hard snowball and shouted “Kalli, Kalli, here I am!” trying to get his attention. As soon Kalli turned in his direction Olli attempted to hit him with it. Kalli however was quick enough to catch the ball and throw it back. Olli was hit in the face by the hard ball and worse, his left eye was hit also. Bad luck for the two friends. Olli could have cried out with pain, but tried to be strong because of Kalli and Kalli immediately came to care for Olli’s bruise. But the damage was done already and all Kalli could do was to keep Olli company till he left the bus in his village. On St. Nicholas Eve Olli felt sick, his eye was black and his head sore. His father treated the eye with a cool pack and the headache with some aspirins. His mother had a hard time persuading Olli to perform in the nativity play. In the changing room he fought tooth and nail as his mother and his former teacher tried to talk him into wearing the long white dress of an angel selected for the chorus members. “I am big now, not your small BOY anymore. I have a big friend! Kalli is my friend!” touching the eye patch protecting his black eye, “Nobody and nothing can spoil our friendship!” Finally his mother and the teachers gave in and he was allowed to perform dressed in a white shirt and blue slacks and an eye patch. The patch however was something special. Before Olli went on stage he put it down to decorate it with two letters, with an O and a K! Olli smiled, “Do you know what OK means Kalli? From then on Kalli and Olli walked hand in hand, at first only from the bus station to the school - but later…? Who knows….? Who can ever tell…..? This story is a sequel to “Kalli and the Young Blacksmith” posted in Awesomedude, Codey’s World, and Storylover. I would like to thanks Anthony for his untiring efforts to improve my writing. Without his help this story would have never turned out this perfect. One thing may leave you wondering in the story. I do not know if American readers (or even European readers) know what the LIMES is. Limes is what the border defence system build by the Roman Empire to fend off the attack of the German tribes is called. Similar border systems also existed in Great Britain. The Limes wall, like the wall separating Western and Eastern Germany and the Great Wall in China, was only of temporary importance. You can read more about the Limes walls by going to www.wikipedia.org and searching for ‘limes wall’. Comments, reviews, questions and complaints are welcomed. Please send them to ruwenrouhs@hotmail.de.